On 16th January 1958, as part of the International Geophysical Year, the training ship “Almirante Saldhana” , commanded by Captain Carlos Alberto Bacellar, was surveying the waters around Trinidade, a barren, rocky island in the Southern Atlantic, some 750 miles north-east of Rio de Janeiro. A civilian technical team was on board, including Almiro Barauna, a photographer. Just after 12 noon, as the ship was preparing to get under way, two of the technical team noticed a bright light in the sky, heading for Trinidade Island. The two civilians shouted to Barauna to photograph the object and within twenty seconds he took six photographs. The UFO approached the island, flew behind Mount Desegado, re-appeared and then flew away. Virtually all of the 48 crew members watched the object whilst on deck and Captain Bacellar, who had been below deck during the incident, insisted that the photographs were developed immediately. He had an improvised dark room set up and took every precaution to ensure that Barauna did not tamper with the film. Of the six snaps, two missed the UFO completely. “No officer or sailor from the NE Almirante Saldhana witnessed the event”. Later investigations did, in fact, reveal that the Navy had no connection with the event and despite the fact that Barauna had previously been accused of fakery, digital analysis of the photographs determined that they were genuine. Since the publication of the Trinidade Island photographs there has been much debating regarding the merits and demerits of the case. In 1994 sceptic Steuart Campbell declared the photographs as genuine but that they were in fact snaps of a mirage of the planet Jupiter and wind and temperature inversions. However, Jupiter is not bright enough to be seen in daylight and it was too high above the horizon anyway to create a mirage. The controversial photographs of a UFO passing over Trinidade Island in the Southern Atlantic in 1958. The authenticity of the photographs has never been properly determined. Translation of an article by Aurelio Zaluar published on "UFO/OVNI Documento" of Oct/Dec 1979. "The crew of the Almirante Saldanha ship saw, on January 16, 1958, a flying saucer over the Trindade Island that was photographed by Almiro Barauna, 43 years, who was aboard to photograph underwater scenes. The attention of Barauna was called by an uproar in the deck of the boat, while several sailors looked at the sky. He got his camera and began to photograph. He stated having seen a saucer doing maneuvers over the boat, approximately at noon, and that the speed of the object was very high. He took six pictures. Both him and the others that saw the object could not notice any sound. The film was developed on board and the authorities released the negatives that presented only a small dark point. Later, in his house, Barauna continued [sic] to enlarge the film and managed to make the saucer appear in the picture. An investigation was started for the verification of a possible montage and in February the Navy confirmed the existence of a strange object in the pictures taken on the Trindade Island. The fact made all first pages of the newspapers of Brazil and of the world. But, at the time, Barauna suffered from all types of attempts of demoralization of part of the press, even of people that said that were his friends, to invalidate his deed. All of this happened 21 years ago [this article was published in 1979]. Today, Barauna lives in company of his wife, still in Niteroi, in a well decorated apartment of Icaraí, surrounded by his 136 cameras, real rarities that compose his small domestic museum. It was there that we went to hear him. Almiro Barauna is a very well known photographer in Niteroi. He actively participated on the Rio press, for his ability to put the camera to the service of the fact, in sensationalist photos [sic]. In 1954, in the magazine "Mundo Ilustrado", he presented photos with a text of Vinícius Lima entitled "A Flying saucer was at My House. . . " where, in a curious and critical journalistic article, he taught "how to make a Martian aircraft" with two chips of the then Carioca Fleet, joined on their flat faces, in "photographic tricks" that could serve as "exploration and fun". 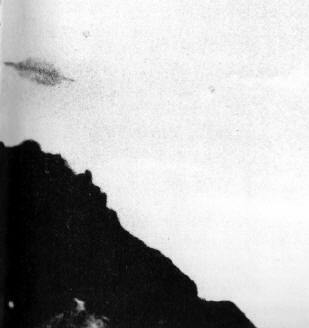 This he did in face of his disbelief in UFOs, to ridicule the article published by Joao Martins and Ed Keffel, that photographed in May of 1952 an "Unidentified Aerial Object" in Barra da Tijuca, whose report had been published in the magazine "O Cruzeiro" of the time. Barauna didn't know that he would later be victim of his own incredulity. This because, having taught before "how to manufacture a flying saucer in any scenery", he could never think that four years later he would be witness of a real UFO sighting, and that he would photograph it in four poses over the Trindade Island. Then his faith started to exist. But all the arguments that he used against Joao Martins' article were used back against him. But the Navy authenticated the pictures, after exhausting exams in laboratory, concluding in a secret report that the pictures were authentic. This Navy report was published in a report by Jorge C. Pineda, in October of 1971, in an Argentinean magazine, though secret and never having been published in Brazil. "The year of 1958 was the 'International Geophysical Year'. The Navy used to invite teams that embarked at the old school ship 'Almirante Saldanha', to the scientists' service. On that day, we were on board with the team of the Icarai Underwater Hunt Club, composed of five people: Amilar V. Filho that directed the group. Jose Teobaldo Viegas, retired Brazilian Air Force captain, industrial and director of Niteroi Aero-club; Mauro Andrade, employee of the Bank of London; Aloisio and me, that participated in the group as specialist in underwater pictures. After two days at the island, we were on board, on January 16, around twelve o'clock. I was feeling sick with the sway of the ship, when I heard the sailors' confusion, shouting: 'look at the saucer!'. Viegas came running to call me, telling me to pick my camera to photograph a flying saucer over the ship. I caught the Roleflex [sic] close to me (a pity that the Leica with a telephoto lens was far away, in the cabin), because I was going to photograph the hoisting of a launch, from the sea to the ship. Vieira Filho also waived to me, saying: 'Bring the camera, bring the camera!' All showed [pointed to] the sky, where a bright object approached the island." It was 12 hours and twenty minutes. It came from open sea and drove itself to the tip of the Galo Crest. When it was going to pass by the Desejo [sic, actually Desejado], I took two more photos. 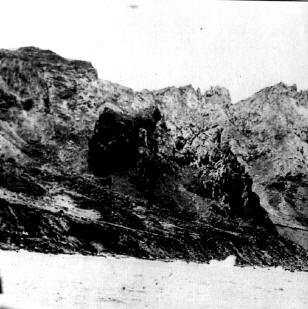 The object shot behind the mountain, during some seconds and reappeared, going again to the sea. I went shooting the obturator. I took six pictures, but only got to use four, because in two I was pushed and focused only the water. The presence of the saucer caused chills in all of the [people] present, 48 people in all who saw it and there was even an official that became truly terrified. In fact, it was to be seen the expression of dread in the crew, pointing weapons to the sky." "Yes. I paid for my previous jokes. But the fact that part of the press tried to ridicule me was not exactly because it didn't believe on me, but because I gave an exclusivity contract on the pictures and interviews for the Diarios Associados [of then Brazilian media mogul Assis Chateaubriand]. On the margin of the events, they had to create their news, they couldn't be out! It just happens that I made four copies that were taken to the then President Juscelino [Kubitschek] and, there in the palace [that at the time was in Rio de Janeiro, then Brazilian capital], a journalist of the "Correio da Manha" [also of Rio] got the pictures and was going to "scoop" our work on the following day. Knowing about that, I sought Joao Martins, in "O Cruzeiro". I was a professional and wanted to take advantage of my work. Because of that, I sold the pictures to the "Diarios Associados", and "O Jornal" published them the following day, at the same time with the "Correio da Manha". Later the Agencia Meridional [part of Diarios Associados] distributed them to the whole world, and they were published in all newspapers, "Life", "Time", even in Russia. But the "Diario de Noticias" and the "Tribuna da Imprensa", that didn't have access to the material, were against me. The material was exclusive of a network, and I was prevented from speaking to the newspapers. Therefore, discovering an article that I illustrated in the "Mundo Ilustrado", entitled "A Flying saucer was at my House...", where I showed how you could superpose on the [photographic] plate two chips of the old Carioca Fleet, they reproduced phases of the sequence made by joke. It is the old saying: "He who hurts with iron, with the iron will be hurt..." [Quem com ferro fere, com ferro sera ferido]. Then, they tried my demoralization. They made fun with the saucer, set up pictures in the Jockey Club, on Barra and made a lot of fun of me..."
The Navy Ministry, through the Command of Naval Operations, made a secret report, examining the case. The then representative Sergio Magalhaes asked for information in the House [of representatives]. They say that he, on the occasion, showed only the cover of the Secret Report of the Navy on the Trindade Island, saying that he could not show the rest. documentation that was able to take the label of 'Confidential' and 'Top Secret' [Maximo Secreto]. Its publicizing is due to a retired official of the war navy of Brazil, whose name cannot be revealed, for obvious reasons. The way by which it was obtained, cannot be revealed either". We examined the referred document in Spanish, by which official correspondences are exchanged between the Rear Admiral Luiz Felipe da Luz and the Admiral Antonio Maria de Carvalho, highlighting the importance of the event. There are also requests of information signed by M. Sunderland, Naval Attache from the United States. "The alarm of UFO was given by the crew's members in the prow and stern of the ship"
"All recognized that the object that appeared in the photos was identical to the one they had sighted on the air"
"The photos that were taken in no more than thirty seconds"
"A strong emotional disturbance was observed in all of the people that sighted the object, including the photographer, civilians and the members of ship's crew"
"The statements of the people that sighted the object: They saw the photos and declared that they had seen exactly what appears in the pictures." "The technician of DHN [Hydrography and Navigation Administration] of the Armada after analyzing the negatives, affirms that they are authentic." "The technicians of the Aerophotogrametric Service of Cruzeiro do Sul, just after microscopical exams for verification of brightness and outline details, affirmed: 'There was not any sign of montage'". f) The last conclusion mentioned allows me to suggest to your Excellency that this High Command must take into consideration all the information obtained on the present subject, aiming to reach more conclusions above all doubt"